If you want to get truly technical, there are two kinds of biopics. Those which are about historical figures that we know, and those which are about people who have not penetrated the zeitgeist. The latter category holds a particularly advantageous position, as they are introducing us to a new and unknown entity. Therefore, the bulk of the story should be surprising and fresh. Movies that focus on well-known individuals run the risk of telling an old or well-known story. Why would we want to watch a movie about something that we already know? However, a rare few movies can unearth a revelatory tale about a famous person. Elvis & Nixon does this one better and invites us into a secret meeting between two very famous and seemingly very different individuals and unveils an amazing story. It's December, 1970 and Elvis Presley (Michael Shannon) has decided that he needs to help America. He flies from his home in Memphis to Los Angeles, where he is met by his old friend, Jerry Schilling (Alex Pettyfer). Jerry was once a member of Elvis' team, but he now lives in L.A., where he works as a film editor. Elvis lays out his plan to Jerry and soon the two are flying to Washington, D.C. Once there, they travel to the White House, were Elvis leaves a letter for President Richard Nixon (Kevin Spacey). The letter outlines Elvis' desire to meet with Nixon, as he wants to be an "Agent At Large" and aid with the war on drugs and apathy in the U.S. Nixon staffers Bud Krogh (Colin Hanks) and Dwight Chapin (Evan Peters) take this idea to Nixon, who refuses at first, but finally gives in. What follows is one of the weirdest meetings in history. I knew that Elvis and Nixon had met at some point, as I'd seen the famous photo of them shaking hands (the picture is the most requested from The National Archives), but I knew nothing about the meeting itself. Elvis & Nixon takes us through this meeting in a very interesting manner. The movie hits the ground running and jumps right into the story. It does us a favor by assuming that we know who Elvis and Nixon are and why they were important. And then it's off and running, chronicling a bizarre 48-hour period in which Elvis makes his way into The White House. My wife admitted that she'd been hesitant to watch Elvis & Nixon, as she was afraid that it was going to be too serious. The funny thing is that the movie actually is serious. It takes an unflinching look at the series of events and doesn't sugarcoat things. The movie is straightforward and plows through the material. But, the entire thing is so bizarre that the story comes across as a comedy. Nearly everything that Elvis says is so strange that we can't help but laugh and Nixon's uptight response to the whole affair is hilarious. The more that we learn about Elvis' plan, the more fun that the film becomes and we realize that we are privy to one of the strangest stories from American history and one which truly falls into the category of "you couldn't make this stuff up". Elvis & Nixon should serve as a template as to what a true-story movie can be. The movie does have the advantage of presenting us with two characters with which we were already familiar. But, most of us won't be familiar with this story. And the more that you learn, the more that you'll question the reality of what you are seeing. This is one of those movies which will have you scouring search engines after watching it to verify the story. In other words, we truly learn something from Elvis & Nixon -- I had no idea that Elvis was so conservative. And while we are learning, we are thoroughly entertained. As noted above, the movie is well-paced and packs it 86-minute running time with entertainment. As for the acting, Shannon admits that he's not doing an Elvis impersonation and, truth be told, he doesn't make a very good Elvis. But, given his ability to play quirky roles, we thoroughly believe that he believes what he is saying. Spacey certainly personifies the gruff nature of Nixon and he's clearly having fun in the role. Elvis & Nixon has been overlooked by audiences, but it certainly deserves to be seen, as you will definitely find something to like. 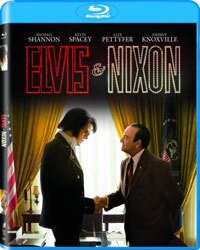 Elvis & Nixon was nice to find a role for Johnny Knoxville on Blu-ray Disc courtesy of Sony Pictures Home Entertainment. The film has been letterboxed at 2.35:1 and the Disc contains an AVC 1080p HD transfer which runs at an average of 25 Mbps. The image is very sharp and clear, showing no overt grain and no defects from the source materials. The colors look good and the image is never overly dark or bright. The level of detail is notable and the picture is never soft. The Disc carries a DTS-HD Master Audio 5.1 track which runs at 48 kHz and an average of 4.0 Mbps. The track provides clear dialogue and sound effects. The bulk of the movie is dialogue driven, and the speech is always audible and intelligible. We do get some notable sound effects from the airplane sounds and street noises. These effects are noticeable, but they don't interfere with the dialogue. The Elvis & Nixon Blu-ray Disc contains only two extras. We begin with an AUDIO COMMENTARY from Director Liza Johnson and Producer/Consultant Jerry Schilling. "Crazy But True" (3 minutes) is a brief featurette which offers comments from the cast and Schilling and some brief on-set footage. I had hoped that this would have been a much longer piece which would have touched on the bizarre reality of the story.